Back when chart singles were released on 7" vinyl, there was always a chance that a DJ would flip the record over and play the B-side instead. In practice, that didn't happen very often - but throughout the rock era, there have been a number of hits that started out life as B-sides. Joining the ranks of "I Will Survive" and "How Soon Is Now?" 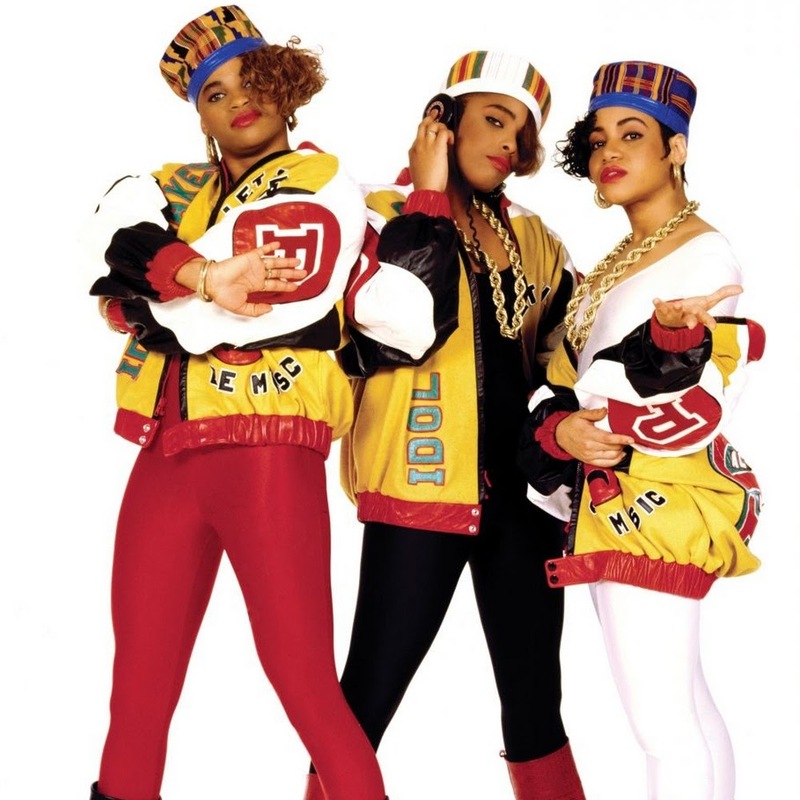 was one of the ARIA chart's new entries from this week in 1988: Salt 'n' Pepa's "Push It", a track which first appeared as a bonus track on the 12" single of "Tramp". "Push It" would get very close to the top of the Australian singles chart, a rarity for a rap song in those days. Meanwhile, John Farnham was still at the very top of the ARIA singles chart this week in 1988 with "Age Of Reason", the third week out of four the track would remain at number 1. Still a year or so ahead of the indie boom in Australia, Brisbane's Ups And Downs made a second visit to the top 100 with their first release for Mushroom Records. 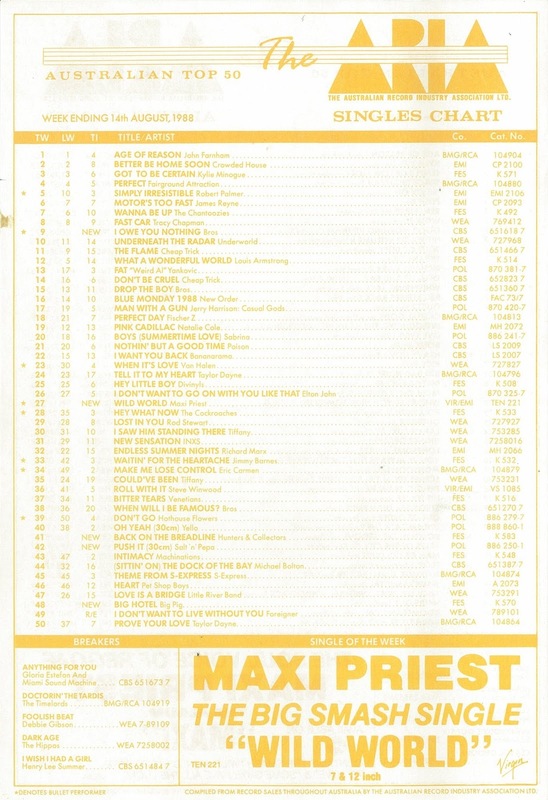 It's been a while since we've had a Breaker to recap, and this US number 1 single is another of those oddities that peaked inside the top 50 of the AMR (number 49) but outside the ARIA chart (read about the reason for the two charts here). In America, the ballad not only reached the top of the Billboard Hot 100, it also made 17-year-old Debbie the youngest artist to write, produce and perform on a number 1 track. With achievements like that, it's unlikely she ever imagined she'd end up appearing in schlock horror films like Mega Python Vs Gatoroid two decades later. Despite "Breakaway" being a runaway success, the novelty of Big Pig - aprons, numerous band members and lots of kettle drums were all pretty unique - started to wear thin with this next single from Bonk faltering on the ARIA chart. It didn't help that "Big Hotel" was nowhere near as good a song as "Hungry Town" or "Breakaway", but at least it reached the top 40, something that none of the band's remaining five singles did. How this was ever hidden away as a B-side is a mystery, since this sassy statement of intent from Cheryl "Salt" James, Sandra "Pepa" Denton and Deidra "DJ Spinderella" Roper had hit written all over it. Even in rap-cautious Australia, the song was a top 5 smash. In fact, "Push It" reached 16 places higher here than it did in the States. Yep, despite selling over a million copies in the US, "Push It" peaked at number 19 there. Follow-up "Expression" (which didn't make an impact locally) was another platinum-selling smash in America and it only managed to reach number 26 - a sure sign that US radio stations weren't necessarily in tune with what records people were buying. Singles-wise, the What's A Few Men? album was a bit of a disappointment for the Hunters, with first release "Do You See What I See" only managing to get to number 33 and second single "Still Hangin' Round" missing the chart completely. In 1988, the album was renamed Fate for its US release and a handful of new songs (including this track, which was released as a single here) were added. As you can see, it didn't help matters very much with "Back On The Breadline" getting no further than this position. His first UK top 20 hit had been a remake of "Some Guys Have All The Luck", a song previously recorded by (among others) Rod Stewart and Robert Palmer, and with this cover of Cat Stevens' 1970 single, the reggae singer born Max Elliot cracked the Australian chart. It wouldn't be the last time we'd see him in the top 10 - with another big hit (and an original song, just for something different!) to come in 1990. With Bros-mania showing no sign of abating, the genetically blessed trio's third hit (which had originally been their debut single in 1987) blasted straight into the Australian top 10 - a feat we'd been seeing a lot of in the previous few months. "I Owe You Nothing" is my favourite Bros single (it made my personal end-of-year top 10 for 1988) and it was also their highest charting hit in the UK, where it reached number 1 after tanking at number 80 on its first release. The re-release came with a slight remix and a new clip, which always made me want to own a jeep. Next week: we travel back through time to another week in which a song leaps straight into the top 10. I've given you a clue there to just which song it is. Plus, two female singers who were massive in the early '80s return. Before then, I'll start my countdown of my favourite songs from 1996. 'Foolish Beat', to me, was a pretty blatant attempt to write a 'Careless Whisper', even down to the title being mentioned once only, and in the second verse. I think I was a bit confused about the gender of the 'Big Hotel' singer at the time. He looks a bit like Yazz. I don't know why they didn't go with another Sherine-lead track after the success of 'Breakaway'. 'Push It' is a classic, and still very quotable. And those severe haircuts! 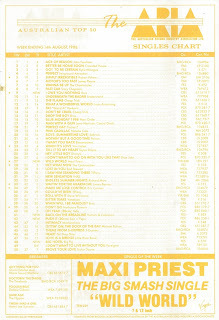 I remember thinking the Maxi Priest track seemed very 'fresh' in sound at the time, and had a neat video to boot. I think I prefer the original mix of 'I Owe You Nothing' to the '88 re-release version.